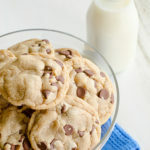 My sister sent me this delicious chocolate chip cookie recipe with the above picture that she took. I made them last night not knowing until mid-recipe that the dough needs to chill for 1-3 hours. Well, I only had time to let it chill for 1 hour, so my cookies turned out a little flatter than they should have if the dough chilled for 3 hours. Anyhow, these were VERY yummy! Thanks, Ang, for the recipe! 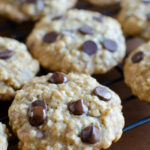 Since there are SO many different chocolate chip cookie recipes out there, I was going to name these “Sister Angie’s Chocolate Chip Cookies.” But, randomly I remembered that during Angie’s freshman year of college, one or some of her friends called her Wookie… I wonder if she even remembers that. So, that’s how I came up with the name. It turned out kind of rhythmically cute! Combine flour and baking powder in a small bowl and mix with a fork. Set aside. Soften butter/shortening in a microwave oven (use a microwave safe mixing bowl or glass measuring cup) stirring every 15 seconds until very soft. Add granulated sugar, brown sugar, salt, and vanilla and beat well. Add each egg separately beating until creamy.Add flour mixture (1/2 cup at a time) while beating. Add chocolate chips and nuts. Refrigerate for 1-3 hours in covered bowl. Pre-heat oven to 375°F 15 minutes prior to first batch. 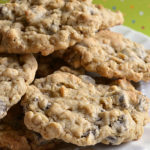 Drop rounded teaspoons of dough on cookie sheet covered with fresh aluminum foil. Bake 10-12 minutes checking every two minutes after 8 minutes for golden brown appearance. After removing from oven, slide foil and cookies off sheet together and let sit 5 minutes before removing the cookies from the foil with the back side of a spatula. Make sure that cookie sheet is cool between batches. I used two so that one had a chance to cool before putting more on. Store in an air-tight container for up to one week. Makes about  dozen cookies. 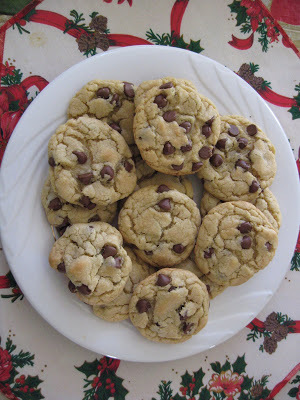 I’ve been sharing your World’s Best Chocolate Chip cookie recipe with a lot of people lately. 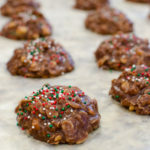 I’ve still never made them, but they are super good! I’ll have to try these too.